Pakistan supports the fair position of Azerbaijan in the Nagorno-Karabakh conflict, as said by the President of Pakistan Arif Alvi during a meeting with a delegation of the Azerbaijani Ministry of Defense in Pakistan, Trend reports referring to the Azerbaijani Defense Ministry. Expressing gratitude for the reception, Azerbaijani Minister of Defense Colonel-General Zakir Hasanov conveyed warm greetings and best wishes from President of Azerbaijan Ilham Aliyev to Arif Alvi. Noting that Azerbaijan attaches great importance to relations, particularly to military cooperation with Pakistan, the Minister of Defense stressed the importance of expanding cooperation in the field of security, as well as military, military-technical, military-educational and other spheres. President of Pakistan Arif Alvi, in turn, asked to convey his greetings and feelings of deep respect to the President of Azerbaijan. The President of Pakistan, noting the high level of interstate relations, as well as friendly relations between the two nations, stressed the importance of developing cooperation in defense, military-technical and other fields. 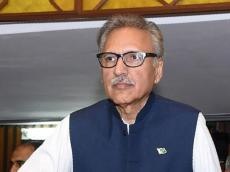 Arif Alvi, expressing satisfaction with Pakistan’s support for Azerbaijan in the settlement of the Nagorno-Karabakh conflict, and noting that this will continue in the future, stressed that Pakistan does not recognize Armenia as a state due to its occupation of Azerbaijani lands. He noted the importance of resolving the Nagorno-Karabakh conflict within the territorial integrity of Azerbaijan. The parties also exchanged views on many other issues of mutual interest during the meeting.